We have recently had the opportunity to review a product we hadn’t seen before through the Homeschool Review Crew. One Page a Day: Double Digit Math Problem Workbook from Channie’s Visual Handwriting & Math Workbooks is perfect for young children needing a little extra math practice or busywork. As simple as it sounds, Channie’s Visual Math Workbook, One Page a Day Double Digit Math Practice has 25 problems on the front and back of every page that are each 2 digits. Geared toward grades 1st-3rd, this workbook strives to keep math simplistic, helping children practice and keeping their problems in line. 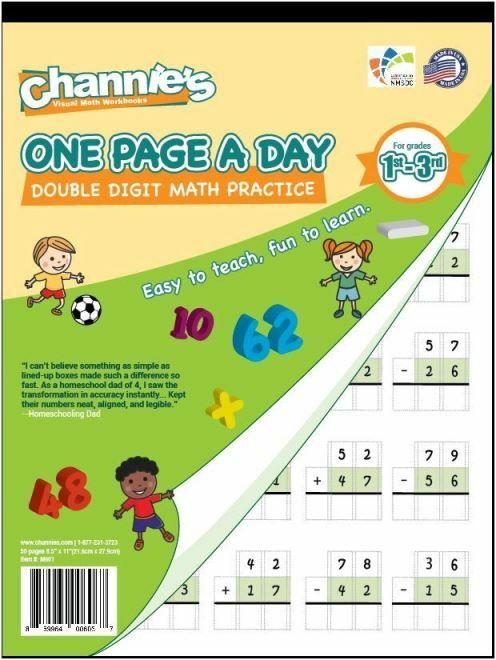 Channie’s Math Workbooks also offers a Single Digit Math Practice for grades pre-k through 1st grade and a Triple Digit Math Practice for 2nd and 3rd grade. Also available from the same company is their line of handwriting workbooks, which includes Easy Peasy Alphabet, Quick & Neat Cursive, Quick & Neat Alphabet Pad, and more! I’m always game for a little extra math practice, however my 1st and 2nd grader weren’t thrilled with a paper filled with problems and without a fun aspect. Their actual response was “Do I have to do all of it???”. Once they got started, however, I didn’t hear any more complaints and I don’t think they really minded. Being geared toward 1st-3rd graders, I thought the workbook would stick to just the basics of addition and subtraction. I found that some pages in the workbook that we received needed my children to have already learned the borrowing concept in subtraction. In my children’s math program, borrowing isn’t introduced until the middle of 2nd grade. That doesn’t deter me, though, as we will keep those worksheets for my 2nd grader to do later this year. My 1st grader is nowhere near ready for that concept. I do like how everything is neatly lined up so it’s easier to see and make sure you’re adding and subtracting the correct numbers. However, as a parent of 5 children, I would have loved to have had a quick answer sheet in the back. Of course I can figure out the answers to correct my children’s work, however I would love to use my time in other ways rather than correcting a math sheet. I think this book would have been better geared toward 2nd-3rd grade, with maybe an easier book for 1st grade without the borrowing. Overall, I’m happy with how easy it is to just tear out a page for extra practice and have it ready to go. For more information, you can visit Channie’s Visual Handwriting & Math Workbooks website. You can also find them on Facebook. More reviews on this product and other products by this same company can be seen by clicking the banner below. 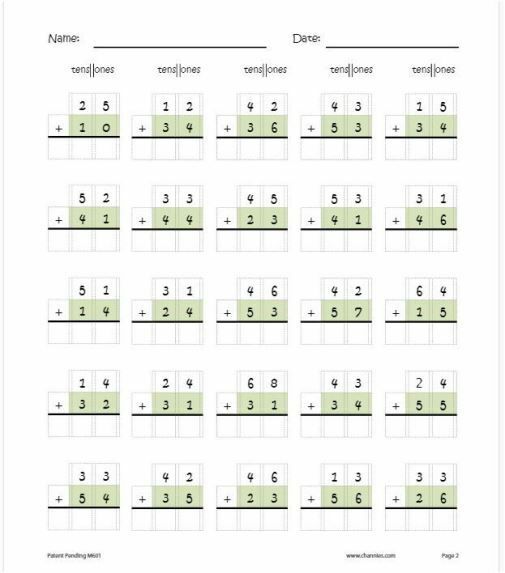 These are nice worksheets based on 2 digits to 2 digit addition. Lots of problem kids can solve in one page. For fun aspect in grade 1 and grade 2 students should see https://logicroots.com/math-worksheets/. My nephew who is in grade 2 is using these worksheets for doing his math practice.